2014 is the 80th anniversary of the workers uprising in Asturias, Spain and its subsequent brutalisation. But it was an uprising that led to a revolution on a massive scale across the country. 2014 is the 80th anniversary of the workers uprising in Asturias, Spain and its subsequent brutalisation. Less than two years later, a revolution that rejected oppressive hierarchy in all its forms was attempted on a massive scale across entire regions of the country. In 1976 Noam Chomsky referred to these events as ‘the best example to my knowledge’ of a large-scale anarchist revolution. In countless examples from small communities of a few hundred people up to entire regions of hundreds of thousands, in industrial, agricultural and military contexts; communities and relationships based on equality were created. For Anarchists then and now, that revolution, however short lived, demonstrated that another world is possible. In 1939 Emma Goldman wrote to the British anarchist Herbert Read saying: ‘how right you are when you say that Spain was a turning point, and that it will probably be a century before we recover from that tragedy’. The tragedy Goldman spoke of was the sabotage of the anarchist revolution by the other anti-fascist forces so well portrayed in Loach’s Land and Freedom and Orwell’s Homage to Catalonia. Between the summer of 1937 and the spring of 1938 the government effectively criminalised the revolution, disarmed the militias and dismantled the collectives. One of the greatest examples of anarchy became one of the first casualties in the war against fascism that would engulf the world and claim the lives of millions in the years to come. The seeds of anarchism had long been germinating in the fertile soils of Spain. The first trade union in the country was set-up in Barcelona in 1840, coming almost immediately into direct conflict with the government and the ruling elite. In 1855 a general strike led to open revolt breaking out and workers marching under the banner, ‘The right to organise or death’. By 1868, in the run up to the First International, the Russian anarchist Mikhail Bakunin had begun liaising with the Spanish workers organisations, and Spanish anarchists were beginning to lay the foundations of the 1936 revolution. Rudolf Rocker in his book ‘Anarcho-Syndicalism’ explained how ‘tens of thousands of [Spanish] workers joined the great workers alliance and adopted the Anarcho-Socialists ideas of Bakunin’. In the decades that followed the ruling elite and the workers found themselves in increasingly open and bloody confrontation, the cycle of violence culminating in the ‘Tragic Week’ of July 1909. In the heat and humidity of the Barcelona summer workers protested conscription, police met protests with violence, workers organised into revolutionary committees which only further incited police to respond with repression and brutality. The conflict eventually reached boiling point as workers built barricades across the streets of Barcelona, churches were burnt down and the police and military came down like an avalanche on the uprising. The development of anarchism as a functioning political ideology applicable in Spain was accelerating. 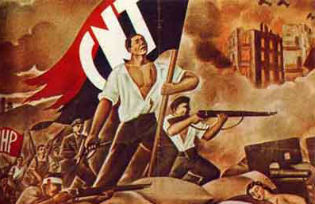 In 1911 the anarcho-syndicalists realised their model of organising by setting up the CNT (Confederation Nacional de Trabajodores/National Workers Confederation), a general workers trade union based on anarchist principles that would over the next 25 years become the dominant workers organisation in Spain. The ruling class felt increasingly threatened by Anarchism and responded in 1923 by installing General Primo De Rivera in a military coup endorsed by the then king. The dictatorship was eventually undermined by its own supporters in the army, bringing about the Second Republic in April 1931. The newly politicised and emboldened republican left started implementing liberal reforms that had the potential to begin redistributing economic and social power. The initial phase of this reform agenda included the separation of church and state, the introduction of non-religious education, extension of constitutional control over the armed forces and a series of social welfare legislations. When faced with the common enemy of an organised proletariat with aspirations of equality, the right wing in Spain – fascists, the officer class, the church and the major landowners – responded by coming together. The left on the other hand was fundamentally divided in its objectives, and the means to achieve those objectives. The urban poor, small landholders, semi-educated middle classes, regional separatists and landless peasants were all pulling in different political directions. The disorganised oppressed class was made up of anarchists, anarcho-syndicalists, socialists, Marxists and republicans and these divisions gave the organised ruling class the opening they needed. By November 1933 a conservative government had retaken power and started to un-weave the minimal reforms only recently put in place. In response, the working class and the political left confronted the government in strikes and protests. It was in this climate that the demographic of the politically active was visibly changing; youth and women’s movements on both the left and right were increasingly taking to the streets alongside the men. In October 1934 the left responded by calling for a general strike, which although short lived in the majority of the country, in one region proved to be a bell weather for what was to come. On the 5 October 1934 the miner’s strikes in Asturias quickly turned into an armed rebellion. The majority of the Asturian rebels were the anarchist CNT and the socialist PSOE (Partido Socialista Obrero Espanol/Spanish Socialist Workers Party), the CNT alone representing 22,000 organised workers in the region. Several of the local groups had a long history of revolutionary tendencies as well as access to large quantities of dynamite in the mines, and were quick to take control of many of the villages. The government and one of the rising stars of the officer class General Franco were equally quick to respond. Using the Air force to bomb villages, the navy to shell coastal towns and the brutal colonial fighters of the foreign legion and the native Moroccan divisions on the ground, the entire region was recaptured within two weeks. What followed demonstrated the lengths to which the ruling class were willing to go in subjugating anyone getting ideas above their station. 30,000 people were imprisoned and political parties, trade union offices and left wing newspapers were all closed down across the country. In two villages alone, hundreds of miners were found slaughtered at the bottom of pit shafts. Across the region there were reports of mass killings, rapes, robberies and systematic torture by the police and colonial forces. In his activist’s history of the CNT, Jose Peirats describes it as ‘reminiscent of the dark days of the Spanish inquisition, while at the same time presaging the blood-curdling crimes of Franco-Falangism’. In February 1936, a left-wing coalition narrowly won the general election with an agenda of re-establishing the programme of reforms started in 1931. Perhaps one of the most significant aspects of this election was the polarisation of political representation. The centre ground that had existed in 1933 was subsumed by the political extremes. The narrow electoral success for the left proved to be the catalyst for the right to once again attempt to overrule democratic process. The unified left, buoyed by their electoral victory needed to pay reparations to the anarchist bloc which had not called its members to boycott the election. Their price was the release of the thousands of political prisoners still imprisoned following the events of 1934. In light of the narrow margins, this decision not only proved pivotal but also demonstrated how large sections of the anarchist movement in Spain had the capacity to go beyond purist theories to real-life application. With the Popular Front in power the liberal reformation of Spain began apace, but before long sections of the military began organising a coup. ‘The general’s conspiracy was denounced in parliament and at public meetings between February 1936 and July 1936’, notes Abel Paz. When Santiago Casares, the Minister for War, was questioned about the Generals conspiring to overthrow the government he responded: ‘there is no reason to be alarmed: the government has the situation under control’. In reality the situation was far from under control. Shortly after the Popular Front took office in February 1936 they attempted to renegotiate the terms of the amnesty for social and political prisoners. While these discussions were underway, many of the provincial prisons were being forced open by local protestors and the prisoners released. The following month, while the government discussed land reform, 2,000 hungry peasants in Murcia went ahead and occupied and farmed unused but privately owned land. The newly elected government kept finding itself two steps behind the opening salvos of a class war. Between 16 February and 15 June 1936 160 churches were burnt down, over 1,500 people were killed or injured, there were over 340 general or partial strikes and 145 bombings. More than 3million workers were by now members of the anarchist CNT or the socialist UGT trade unions, while the right wing organisations had over half a million members, including 50,000 falangists, 50,000 priest and between 20-30,000 retired soldiers. By the time the military coup started on 18 July the CNT had informants amongst the local military and police forces all over Barcelona and Catalonia, allowing themselves the time needed to prepare a response. When the insurrectionists left their barracks in Barcelona just before sunrise on 19 July they were greeted by factory sirens mobilising the ready and waiting armed workers. As the morning went on the rebels found themselves increasingly surrounded by barricades and a well-organised city-wide militia. By midnight the CNT had retaken the Sant Andreu barracks and the 90,000 rifles housed there. The following day the last rebel stronghold in the city, the Atarazanas barracks, was retaken. In July 1936, Spanish anarchism was well organised, ideologically developed, widely represented in the general population, deeply embedded in the communities and workplaces, and championed by veterans of armed struggle. As the Fascist Generals began their coup d’etat, hundreds of thousands responded by initiating the anarchist revolution. Augustin Souchy, who witnessed the revolution first hand, described how, ‘The goal of the Spanish anarcho-syndicalists from their very beginning was to take over the economy and organise it on a collective basis’. The CNT represented between 1 and 1.5 million workers out of a total population of 24million at a time when the working poor in Spain suffered a near feudal lifestyle. According to the 1936 census over 67% of the cultivated land was owned by just 2% of the population and some 845,000 small landholders couldn’t even earn enough from their land each day to be able to afford 1.5 kilos of bread, the equivalent of two large loaves today. 60% of the population in the countryside were illiterate, the majority lived on a ‘diet of chick peas and oil’ whilst many peasant women wore ‘the same shirt for their whole lives’. Gaston Leval argued that it was this ‘social poverty and individual dignity, linked to collective solidarity [that] predisposed a large section of the population to accept libertarian ideas’. In the weeks and months that followed the insurrection, in the region of Aragon in the north east of Spain, ‘five hundred towns and villages with a population of approximately half a million people established collectivism’. Even though the provincial capitals of Huesca and Zaragoza had fallen quickly to the fascists, the towns and villages took it upon themselves to quell their local insurrections and establish anarchy. ‘No one issued a proclamation for a particular type of collectivisation … [there was] no official orientation to direct the peasants. They acted according to their intuitions’. In 1936, Aragon was largely agricultural, its main crops being cereal, grapes, olives and almonds, and like so much of agricultural Spain its villages and towns were desperately polarised economically. In Aragon, however, the workers were highly organised, largely in the CNT, and had en masse been socialised over generations in libertarian ideologies, much like the Catalans to the north east of them. Between 1936 and 1937 Augustin Souchy travelled through Aragon recording the developments of these collectives. In Calanda, a town of 4,500 people, 3,500 joined the collective whilst 1,000 acted as individuals outside of it. Internally the village had stopped using money and had sent 500 young men to fight in the CNT militias at the fronts, yet still they managed to exchange olive oil with a textile factory in Barcelona, build a public baths and a library, double the number of teachers ensuring that over 1,200 children could attend school, pay for 12-14 gifted children to attend the lyceum in Caspe, provide school meals to the children of the militia members, collectivise the barber, pharmacy and doctor, ensure that each day 40 people would receive new clothing on a rota basis and even cover the rent and electricity for the individualists outside the collective. In Alcorisa, the 3,700 who collectivised out of a population of 4,000 managed to send 600 children to school, establish a sausage factory, a shoe factory, a chemicals factory producing cleansers, mineral and soda waters, a library, a community centre, a cinema, and collectivise the tailors and the barbers, in addition to sending 300 militia to the front. In Binefar, a regional hospital performing operations was set up; in the Levante an agricultural university; in Gransol an art school; and in another town an old people’s home. What was achieved in less than a year in those towns and villages was remarkable, ‘the standard of living rose by 50 to 100%’. The anarchist revolution did not stop in the towns and villages. With 8.8% of the people of Barcelona members of the CNT, the city quickly collectivised ‘construction, the metal industry, bakeries, slaughter houses, public utilities (gas, water, electricity etc. ), transportation, health services, theatres and cinemas, beauty parlours, [and] hotels and boarding houses’. For many workers the revolution was the logical response to the capitalist model. On the tramways alone, out of a total of 7,000 employees, 6,500 were CNT members. This at a time when the city transportation infrastructure was privately owned by the sorts of companies that paid Directors twenty times what the conductors were being paid. Almost immediately after taking control of the city ‘the union decided to integrate and consolidate all transportation into an efficient system without waste’. Integrating transportation and getting rid of the owners and bosses increased the trolley cars, from 600 to 700 and ensured ‘better facilities, rights of way, and incomparably better service for the riding public. Fares were reduced from 15 to 10 centimes, with free transportation for school children, wounded militiamen, those injured at work, other invalids, and the aged’. The one thing the capitalists don’t want workers to understand was demonstrated across Catalonia and Aragon in those months. ‘The takeover proved beyond the slightest doubt that modern industry can be efficiently conducted without stock and bond holders and very highly paid executives. Wage workers and salaried employees … can themselves operate the complicated machinery of modern industry’. Not all was revolution, there was still a war going on and the anarchists in Barcelona where playing their part. Not only had they ‘succeeded in turning a famous automobile plant into a munition factory within forty eight hours of July 19th and that it was working day and night in producing the largest amount of arms for the anti-fascist struggle’, but they had managed to put down the insurrection within the city, expropriating 90,000 rifles and were preparing a column of 2,000 libertarian youth under Buenaventura Durruti to march on Zaragoza and Pamplona. This experiment in collectivisation and anarchy would only survive the opening stages of the proxy war being fought by the European fascists against the Spanish workers. Inevitably the undermining of the anti-fascist bloc by the Russian, French, British and American governments meant that the Spanish, Italian and German fascists with all their technologies and inhumanity would eventually destroy the first armed defence against fascism in Europe, and at the same time consign to a few lesser read history books perhaps the greatest example of anarchy in recent times. The people of Spain paid in blood and decades of suffering to leave a legacy for the rest of us. That legacy is what a community can achieve when it pursues the dictum ‘liberty as the basis, equality as the means, fraternity as the ends’. Nick Lalaguna is a writer and fundraising consultant.